A noble couple. In noble professions. He’s a doctor and she’s a teacher. What do they discuss over meals – breakfast, lunch, dinner? they are perturbed by the social, moral, economical and anthropological issues plaguing our country these days. Meet Amrita and Robert, a couple who will speak on behalf of you. Witness their daily discussions on probolmesn you think are worth talking about. Education, medication, elections, corruptions, honour killing, child marriage, social media – you name it and the disease has already made deep wounds in our country’s body and soul. God come to rescue along with Amrita and Robert. Delve into the gospels and teachings of God to find a solution to eacg malady, if you wish to accept. 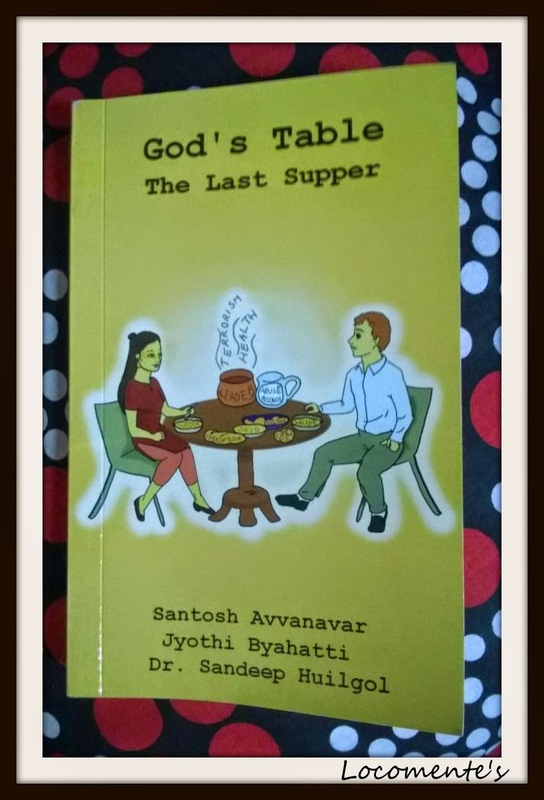 Authors Santosh Avvanavar, Jyoti Byahatti and Dr Sandeep Huilgo present a unique fiction in conversations to remind you how God would have faced and erased a few of our society’s key problems. The cover page consists of a man and woman sitting over a dining table. But, the food items are inscribed with complex issues that we face today – terrorism, murder drug addictions, suicide, killing, etc. The book blurb is elaborate and narrates what can be expected in the book. The book consists of discussions between Amrita and Robert, husband and wife. Every night, they share some of their thoughts and discuss it in detail. In order to find reasons or solutions to the problems, they speak to Paul, God. And, Paul gives solutions based upon the gospels. The book is neatly divided twelve chapters. Each chapter speaks about various issues like how education has become business, euthanasia, honor killing and gender bias to name a few. I am happy that the authors took effort to speak about issues we are facing today. It is put across through simple words and flows with ease. At the end of each chapter, Paul narrates about the root cause for such issues and speaks about how it can be solved. Paul also quotes verses from Bible. I, personally, did not like this idea. God giving solutions is one thing and the solutions coming from Bible is another thing. Suddenly, the book looks like it is preachy and religion driven. In a secular world, this could have been avoided. He could have mentioned in general about the God, not making bible-based .your view is correct.